Growing these seeds will help you create the sustainable environment you are working toward. 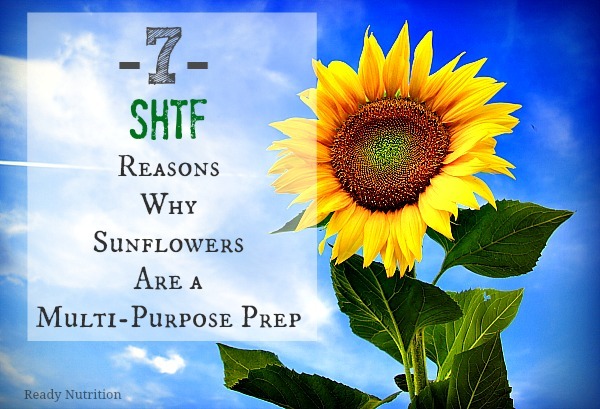 Here are six ways the sunflower can be beneficial in a long-term emergency. Thomas Bulfinch was once quoted as saying, “The sunflower is a favorite emblem of constancy.” How right he was. This faithful flower is as useful as it is lovely, and should be a must in your personal seed libraries. Sunflower seeds are often overlooked for long-term preparedness goals. It’s a small seed, so it’s understandable. That said, it should be considered a multi-purpose prep. Best of all, the seeds are adequately priced and store well. They provide good harvests. With minimal effort, you can harvest a substantial amount of sunflower seeds for a long-term emergency situation. In a 2,500 square foot lot, you can grow up to 20 pounds of nutritious, non-hulled seeds with enough broken seeds left over to feed a winter’s worth of birds. Can be put to use in the garden. The stalk of the Mammoth Sunflower is very strong and can be used in the “Three Sisters” gardening method as a living gardening stake. In lieu of growing corn, grow sunflowers in its place and allow climbing plants such as green beans, peas, squash, etc., to grow up the stalk. As well, when the sunflowers tower over the smaller plants and vegetables in the garden, the sunflowers provide a shade canopy and increase the humidity, as well. This would be a welcome addition to the garden during the dog days of summer. Make your own oil. Has anyone thought about making their own oil for a continued supply? The high oil content of sunflower seed, often over 40%, makes it a great choice in making homemade oil. Oil used for food is one of the first items to disasppear if a long term disaster were to occur. In a 2,500 square foot lot, a family of four can grow each year enough sunflower seeds to produce three gallons of homemade oil suitable for salads or cooking. Source As well, you can make your own biodiesel. Sunflower oil can be used to run diesel engines. Enjoy the health benefits of sunflower seeds. The seeds are high in vitamin A and E, have natural tannins, inulin, levulin, magnesium, selenium, B-1, B-5, phosphorous, tryptophan, copper, B-6, manganese, folate, fiber, iron and zinc, amino acids and Omega-3 Fatty Acids. Seeds can also be sprouted to have a natural source of enzymes. Sprouted sunflower greens, known as microgreens contain up to 100 times the enzymes of regular, full-grown greens. This means your body can more easily absorb the nutritional benefits. Sunflowers have medicinal properties. Aside from the health aspects and usefulness in the garden, they also possess some medicinal qualities. The seeds, leaves and roots can be used to ease symptoms of various ailments. The seeds have antioxidant, anti-inflammatory, diuretic and expectorant properties. They can help reducing the symptoms of asthma, osteoarthritis and rheumatoid arthritis and help in cases of bronchial, pulmonary and laryngeal problems. They can reduce high blood pressure and migraine headaches. Due to their magnesium content, sunflower seeds can also act as prevention against heart attacks and strokes. Sunflower leaves can be used as an infusion to treat high fevers, lung problems and diarrhea. As a poultice, sunflower root is used against snake and spider bites. Most sunflowers are remarkably tough and easy to grow as long as the soil is not waterlogged. Most are heat- and drought-tolerant. Growing these seeds will help you create the sustainable environment you are working toward. Where is a good place to get organic sunflower seeds?